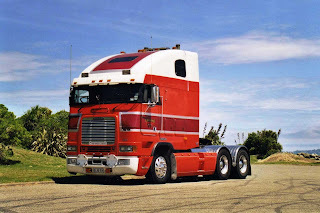 Let's Look at Trucks Again. 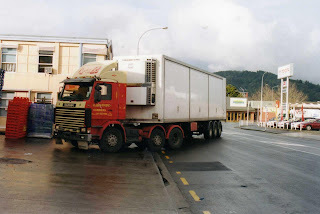 Luciano Giacon's Mainfreight liveried Mack CH has an extension to the back and top of the cab; clearly seen in this picture taken at Pak 'n ' Save supermarket in Petone. A Peterbilt logger on the road near Rotorua. 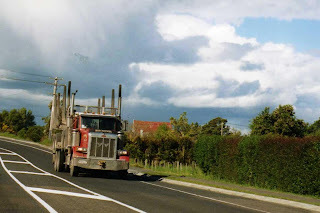 This shot was snapped from the passenger seat while my wife was driving. 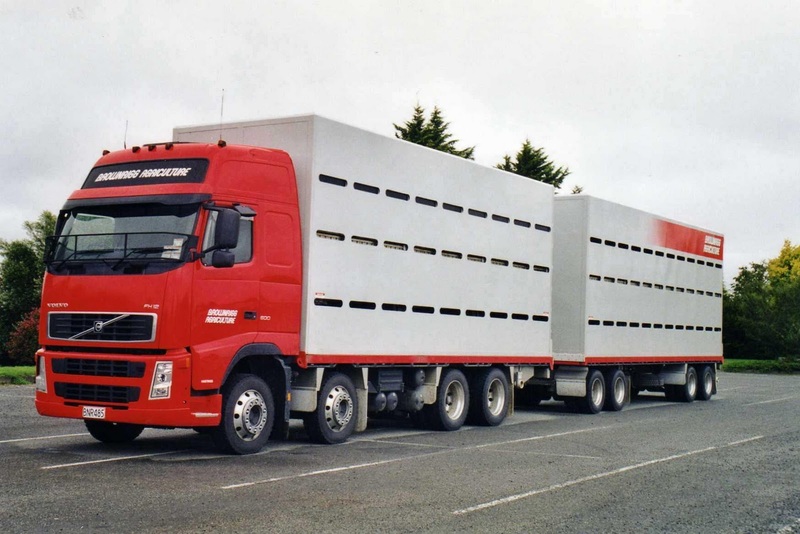 In a similar area to the above picture is this Total Transport 1998 Sterling with sheeted load. 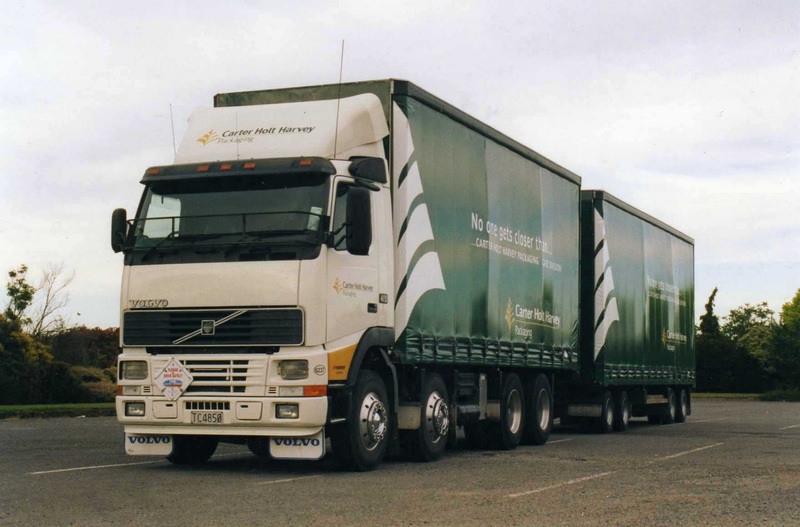 J.R.Dougherty (more commonly known as Bobby D) operates the Mainfreight base in Masterton. His EC14 powered 1996 ERF is painted in the Mainfreight pattern, but in green instead of the more familiar blue with the livery of Hansell's. Hansell's Group Ltd is a Masterton based food product manufacturer. 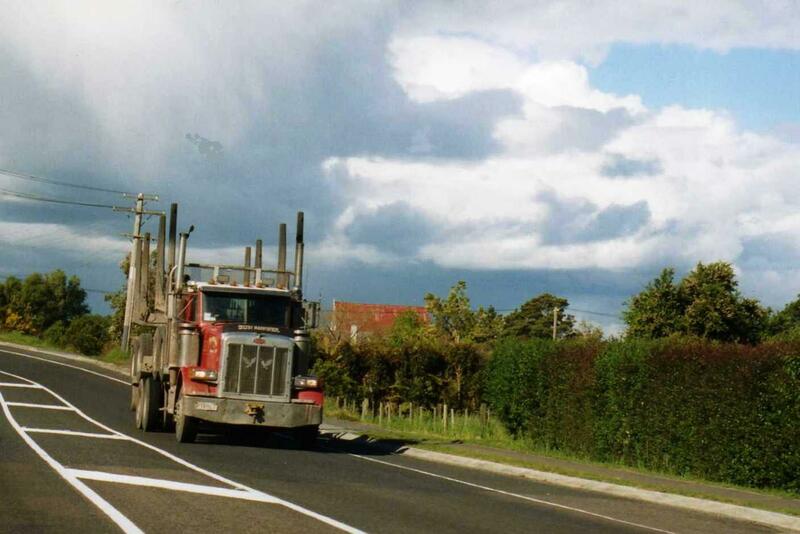 Although this photo was snapped in 2004, Bobby still operates this same ERF and still in the same immaculate condition doing a daily run between Masterton and Wellington. 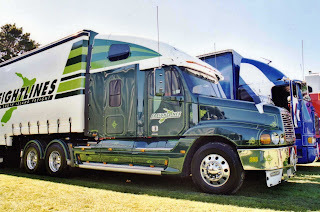 Also snapped in 2004 was this Freightliner with large integral sleeper. A big red Brownrigg rig! 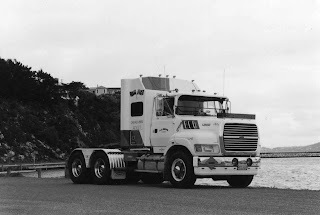 Parked near the boat launching ramp at Lowry Bay is this big Freightliner cab-over. 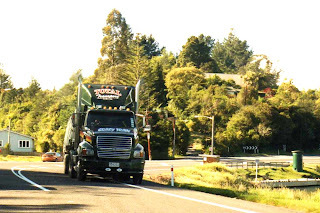 By the look of the asphalt, it's where the local boy-racers spin their wheels. 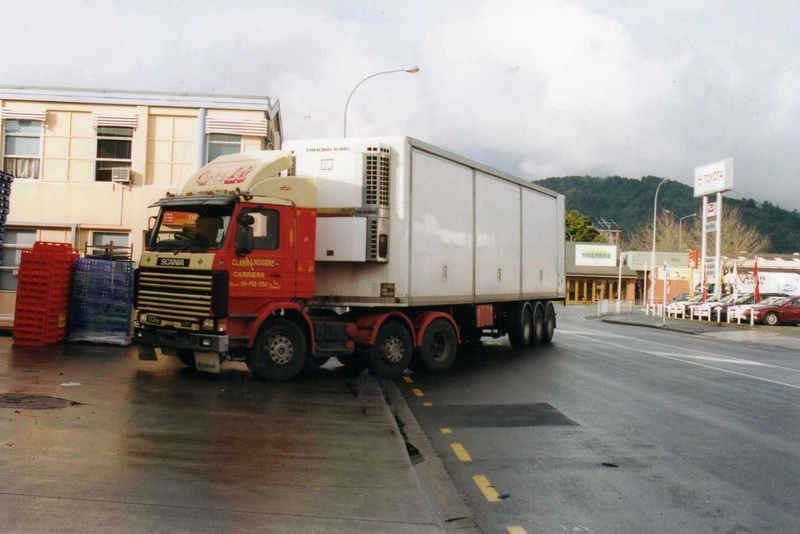 The main street of Taupo is the setting for this 2003 Freightliner Argosy of JP Trucking. 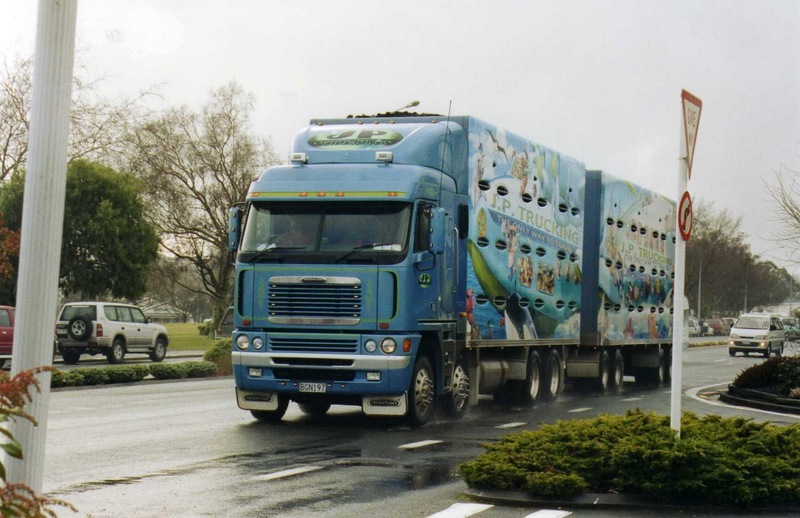 Unusually the trucks in this fleet were all painted in a variety of bright colours and individual liveries. 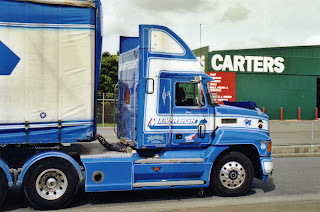 Carter Holt Harvey is well known in the logging and timber industry in New Zealand. This 1995 Volvo FH12 420 with curtains is probably carting wallboard or other similar building product. 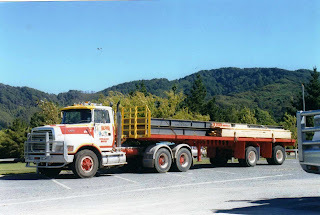 On one occassion when Premier Bacon's Hino was being serviced, they used this 1996 Western Star 3864s. On Saturday morning I was in town and saw this very nice Ford. 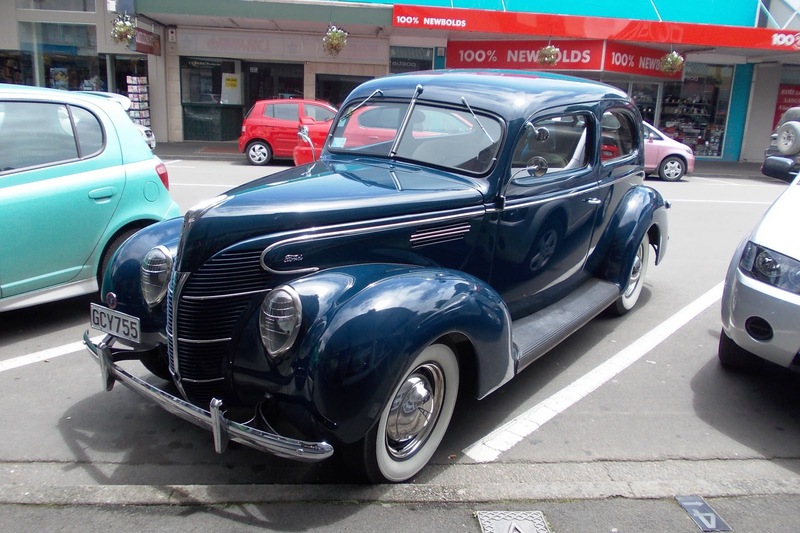 It's a 1939 Tudor in left hand drive and in superb restored condition. 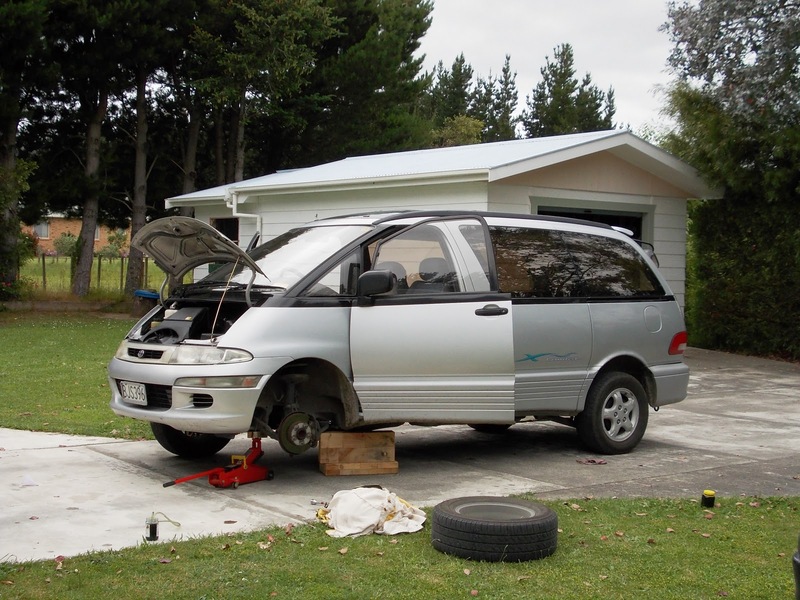 Saturday afternoon I helped my mate Hans bleed the brakes on his car. 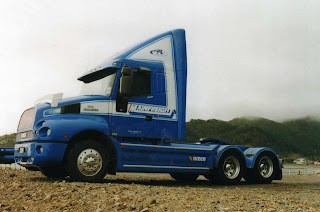 Not much else to report at present, so here are a few more truck photos of the 90s and 00s. 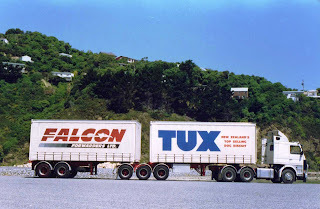 The unit pulling this Falcon Forwarders curtain-side B-train is a 1988 is a Scania R143H. 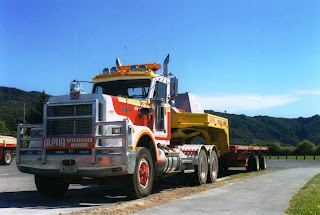 An "H" chassis is not the usual choice to pull a B-train. "H" chassis are the heavy duty version normally seen pulling low loaders or on tippers or loggers that spend some of their time off road. A 1985 Scania R142M with refrigerated box is loading up from a fishing boat at one of the wharves of Wellington. 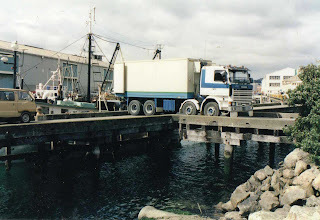 R.A.Empson has his Ford L9000, that he contracts to Chem Couriers, parked up at Seaview. 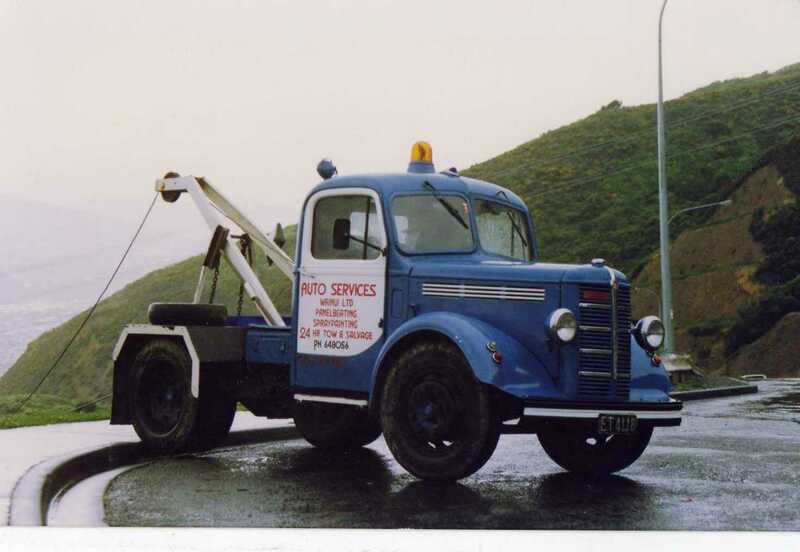 This old Bedford tow truck was being employed to haul up something that had gone over the edge at the top of the Wainuiomata Hill. 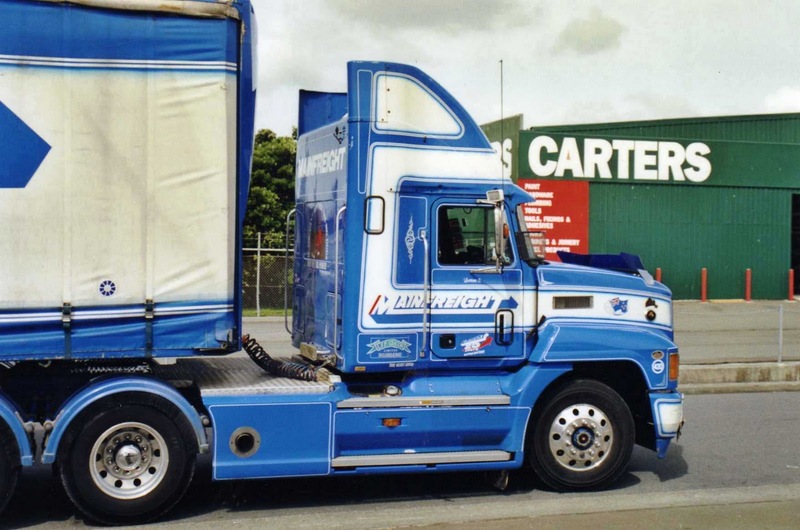 The "something" was so far down it was not visible in the thick bush. 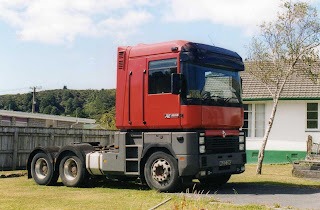 Alpha Specialized Movers mostly relocate houses with this Marmon. Alpha also have a 1993 Ford L9000. 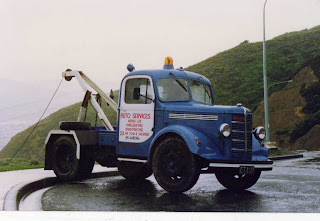 Parked next to the Marmon at Wainuiomata. A 1990 Scania R113m twin steer tractor is a rarity in NZ. I am guessing that it has probably been imported as a used vehicle from the UK. 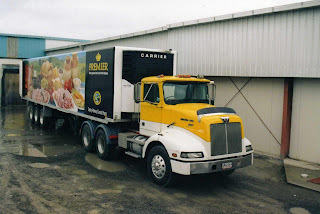 This Clark and Rogers example is turning into Pak 'n Save supermarket in Upper Hutt. Another used UK import, is this Renault AE Magnum 385 parked in the front garden of a house in Stokes Valley prior to going into active service. 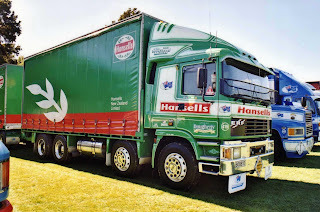 I still see this vehicle quite regularly delivering to supermarkets in my home town. At Seaview with the curtains drawn, is this sleeper cabbed IVECO Powerstar contracted to Mainfreight. 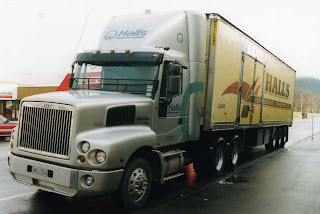 Halls had a similar IVECO, but this one a day cab. Their 2001 version is parked outside Pak 'n Save Upper Hutt waiting to deliver its load. The trailer is still in Hall's old livery.